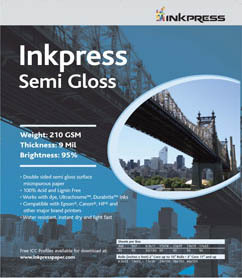 Inkpress Duo Semi Gloss is a microporous double sided paper that is 100% acid and lignin free. It dries instantly and is water resistant and light fast making it ideal of high resolution printing. The double sided coatings make it an excellent choice for brochures, portfolios, greeting cards, scrapbooking, and pre-press proofing. Duo Semi Gloss is compatible with dye and pigment ink printers.